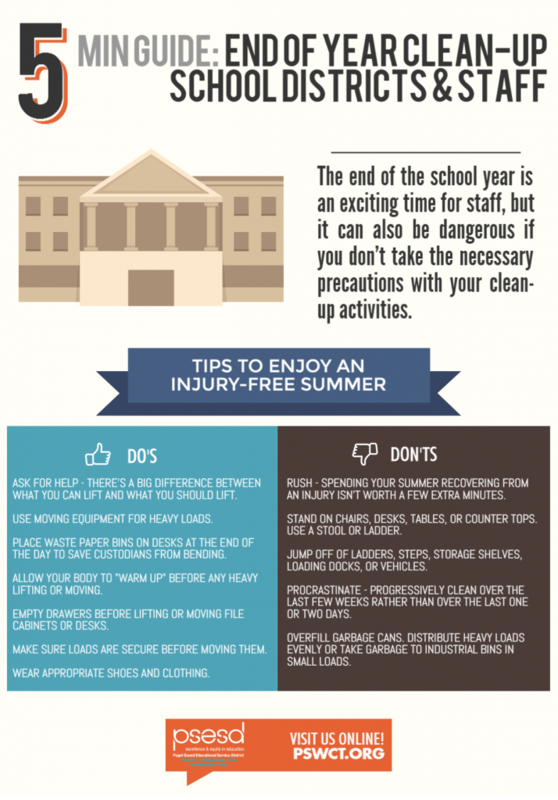 The end of the school year is an exciting and busy time, but can also be dangerous if staff do not take proper care in performing clean-up activities. There are a million fun things to do in the Puget Sound region this summer, but we’re guessing that spending time in a doctor’s waiting room isn’t high on anyone’s list. We want all district staff to enjoy a relaxing and injury-free summer. To that end, we’ve compiled a list of End-of-Year Clean-Up “Do’s” and “Don’ts” to help keep staff safe. Please share the flyer below with your staff. Click here or on the image to acquire a PDF that can be emailed to staff, or printed and posted in school buildings. It is also important for districts to be aware that teachers are not furniture movers and do not have the appropriate equipment, assistance, or training necessary for complicated tasks such as relocating classrooms. Any projects that involve moving heavy or awkward items require thoughtful planning and preparation. Eliminating movement of furniture and equipment when possible. Leaving full filing cabinets where they are and moving files in small bundles. Using professionals to move heavy items. Ensuring an adequate number of staff is available to assist on moving days. Making the necessary equipment available and training staff on how to use it. Planning moving activities like any other major project. The people involved such as the schools officer and custodian, need to be consulted. Remind staff that something as simple as standing on a chair rather than a step stool or ladder could lead to a serious injury. Remind district staff not to stand on chairs or desks; taking the extra time to find a step stool or ladder could be the difference between a relaxing summer vacation or a holiday break spent dealing with a painful injury. The video linked below from WorkSafeBC shows how easily an accident can happen.